Signetics NE555 timer schematic for a "Delayed Light Turn-Off" circuit from their 1973 databook. A couple days ago I posted an update on the Watkins-Johnson databook page that had an unauthorized gag graph titled, "WJ-G1/SMG1 Phase vs. VCTL vs. Frequency vs. Phase of the Moon." 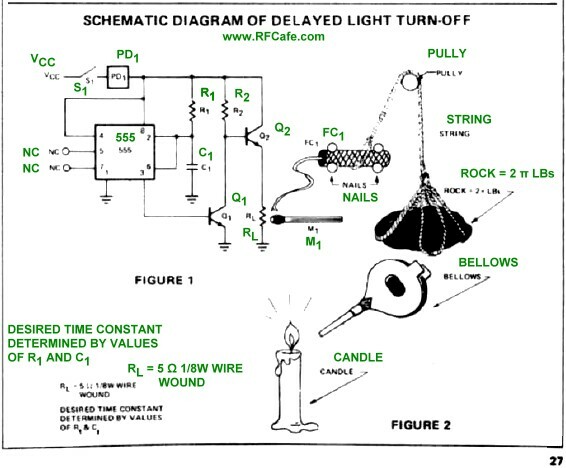 When RF Cafe visitor and sometimes contributor Dr. Marek Klemes* read that, he sent me a note about remembering this "Delayed Light Turn-Off" circuit from the Signetics 555/556 Timer Databook. It took a bit of creative Googling, but he managed to find the datasheet (to the right). The text was a bit washed out from the original low resolution scan, so I reproduced the labels (green). After a delay determined by the values selected for R1 and C1, the output of the NE555 timer goes high and causes resistor RL to heat up enough to ignite match M1. M1 subsequently lights the fuse on firecracker FC1, which has tied to its body a string that wraps around a pulley and holds a rock (which weighs precisely 2π pounds) suspended in space atop a bellows. Once the firecracker explodes, the rock falls on the bellows, causing a puff of air to snuff out the targeted candle. 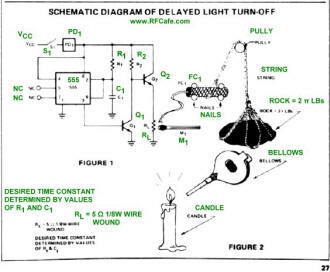 Highly predictable timing is made difficult by the variability of the fuse burn time, the time required for the rock to compress the bellows, and for the air blast to reach the candle flame. The time of flight of the rock is calculable with the first-semester physics free-fall equation of t = √(2h/g), but empirical measurements are required to determine the fuse burn time, bellows compression time, and subsequent air puff travel time to the candle, which compared to time constant of the R1/C1 combination, is quite imprecise. 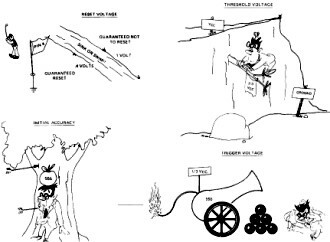 The same Signetics 555/556 databook includes a half dozen or so comic type drawings to help readers grasp the concepts of integrated circuit timer applications. In some aspects it is rather insulting, although it was probably the ploy of the same engineers who dreamed up the "Delayed Light Turn-Off" circuit. I remember being amazed while in the U.S. Air Force seeing manuals in the vehicle maintenance shop that were made to look like comic books, illustrating how to perform tasks ranging from changing oil on a 2-ton truck to overhauling a diesel engine. That was done due to a directive that the manuals be comprehendible by someone with a sixth-grade education. Now that was insulting. * See "Therapeutic Radio," "In the Days of Spark - A Rescue at Sea," and "Standards of Measurement."